Wake up to future Fuji! Adé Bantu, the mastermind behind the radical rap-activists Brothers Keepers and one of the prime movers of the German HipHop scene, brings the deep grooves of Fuji and Afrobeat to the urban styles and sounds of R&B, HipHop and Ragga. Born and raised in England to a German mother and a Nigerian father then relocated to Cologne/Germany, he draws on his forefathers' Yoruba heritage and his African diaspora experience to create an Afropean soundtrack taking Fuji to the next international level. The future is now! "...the album packs ample amounts of fire and fun, there's funk elements that bring echoes of Fela-like Afrobeat to these songs of celebration, self-awareness, cultural unity and African identity as well as effective melding of hip-hop structures with ample live percussion and ongoing call-and-response singing largely in English." 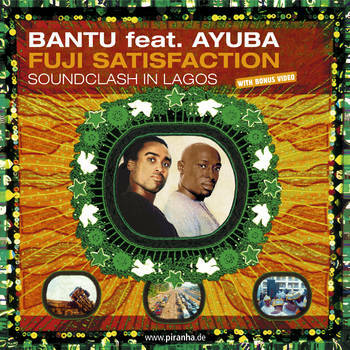 "Nigerian- German artist Ade Bantu has united with Fuji music maestro Adewale Ayuba from Nigeria and Fela Kuti`s original guitar player Oghene Kologbo for a real Fuji firework: FUJI SATISFACTION- a unique listening experience with a completely new style mix of Fuji vibes with Afrobeat, Ragga, Pidgin Raps and Hip Hop!" "Facts up front: This is a collaborative record between Adé Bantu, a Nigerian/German dancehall/rapper who belongs to the Brothers Keepers collective, and Adewale Ayuba, one of the best practitioners of the Nigerian groove form known as "Fuji". I have to give respect to Piranha, one of my favorite world music labels, for thinking of a way to bring Fuji to the world's -- or maybe just my -- attention. Because I love Fuji. This genre, which is named for Japan's majestic Mt. Fuji, is wonderful and elastic and beautiful, and there's a lot of it here to enjoy. It begins in Fela-like Afrobeat, but mixes in more Arabic and Asian influence. Ayuba didn't invent Fuji, but he's the new standard-bearer, and he makes it pop, especially with original Africa70 member Oghene Kologbo chiming in on guitar, bass and drums. Tracks like "Oya" and "Mt. Fuji" bubble, sparkle, and bounce -- it's a joyous sort of music." "A unique listening experience with a completely new style mix of Fuji vibes with Afrobeat, Ragga, Pidgin Raps and HipHop!"